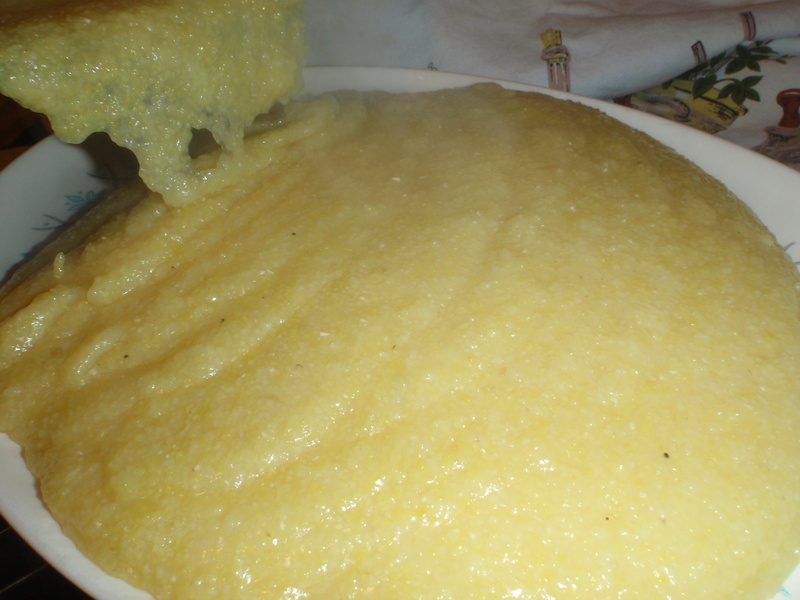 In these first two photos I have just finished baking a batch of polenta, bound and enriched by my parmesan broth. 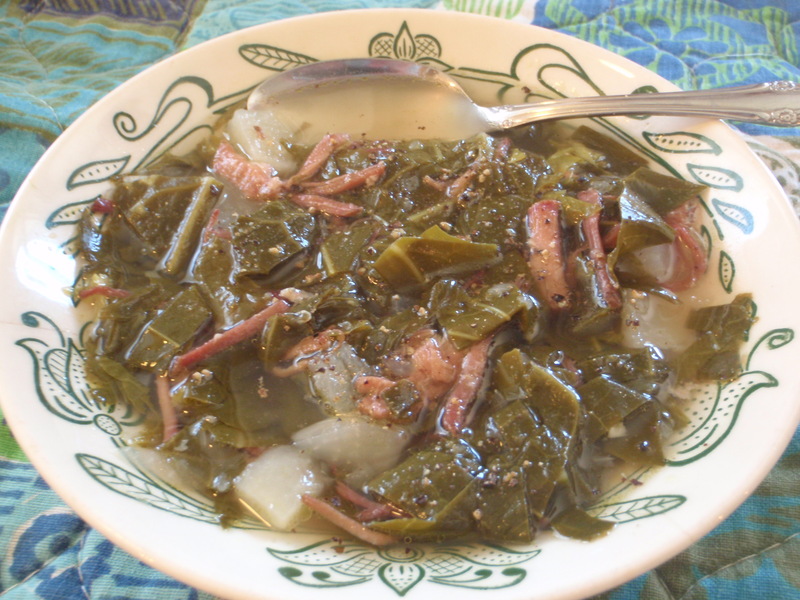 Adorned with nothing more than black pepper, this gruel was plainly the most luscious version I’d ever cooked. Good enough to justify hoarding all those Reggiano rinds! Because I had plans for this corny slab, I managed to limit my portion that morning to a small sampling. 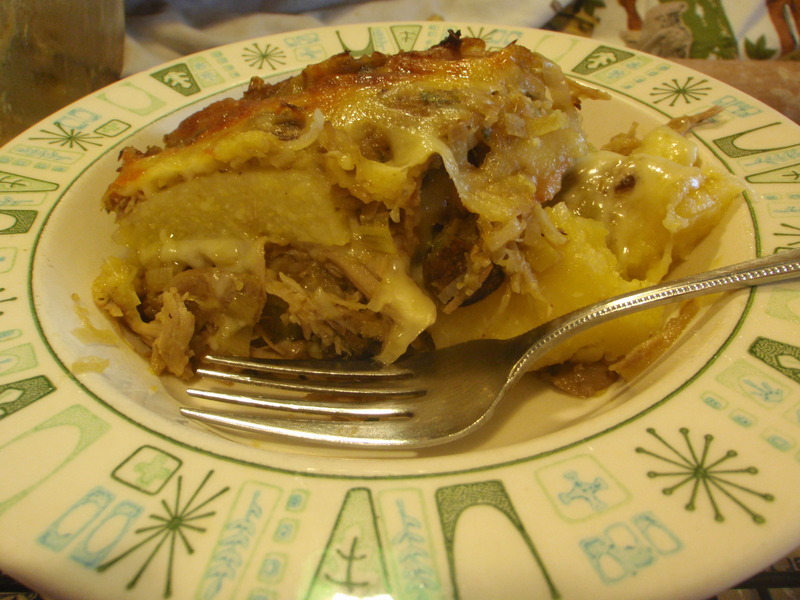 Destined for the limelight in the layers of a catch-all casserole, my polenta plank rested overnight before joining forces with an ensemble cast of leftovers and fresh local flavors. I baked the mess until browned and bubbling. After a 10-minute eternity, we dug on in. A taste of winter on a wintry first day of spring. 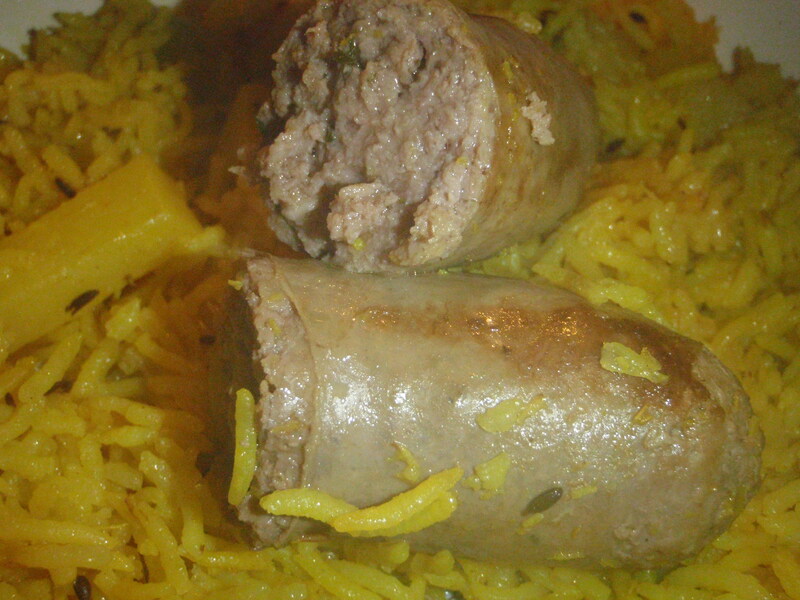 Dai Due‘s Chaurice sausage stuffed our ‘shrooms. Texas portobellos, on sale at Central Market for $3.99 a pound through February 9, served as the foundation for a meaty mound, topped with crunchy toasted bread crumbs. What’s the secret ingredient? Dai Due’s own persimmon Worcestershire sauce. Now that’s a concoction I would have never thought of! Thanks to Wendy, Foodie at Central Market, for suggesting I stuff my mushrooms. 1 pound package Dai Due’s chaurice sausage, or other local sausage. 4 Tablespoons organic or local olive oil. Try Texas Olive Ranch, available at our farmers markets. 10-ounce bag Cora Lamar’s triple-washed spinach from Poteet. Available at Central Market for $2.99 a bag. Or use 10 ounces of another local spinach. Wash it very well. zest of one small local or organic lemon. Check with your neighbor. Get growin’ if you can! 1 teaspoon garam masala. Click for a recipe. 1 cup cooked quinoa. I like to season quinoa with ½ teaspoon ground turmeric for 1 cup of raw quinoa. ½ cup organic or local heavy cream. Organic Valley is great. Click for a coupon. Look for Way Back When’s local dairy products at our farmers markets. You gotta get there early to get cream or butter! ½ cup organic or local ½-n-½ yogurt or sour cream. To read how to make your own, click here. 1 teaspoon organic mustard. I usually buy Central Market’s own brand. Use whatever style you have on hand or prefer. a generous Tablespoon Worcestershire sauce—Look for Dai Due’s peppery persimmon Worcestershire sauce. Tangy and savory, it boasts that familiar kick. generous teaspoon kosher salt. I use Diamond Crystal brand. 1 cup bread crumbs. I crumble up stale bread and freeze it. 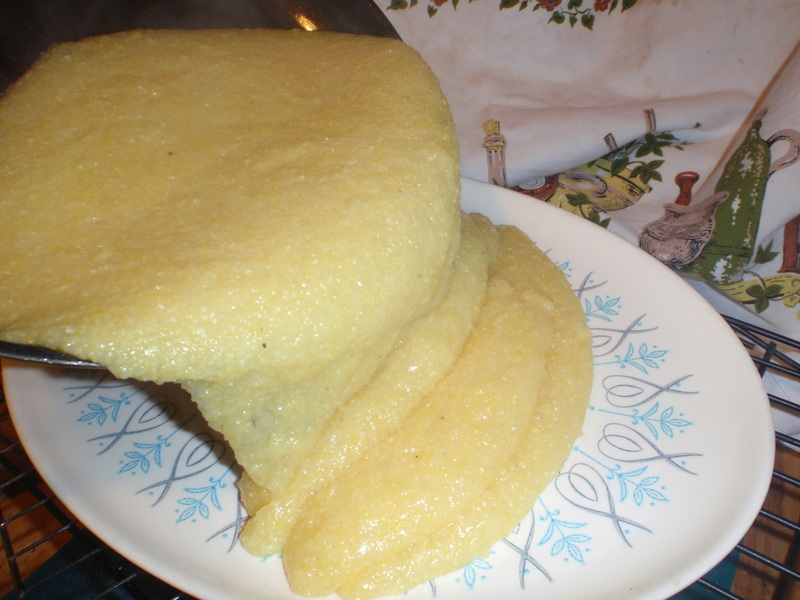 Cornmeal bread, crumbled and lightly toasted, makes incredible bread crumbs. Sometimes I just eat ’em with a spoon. Remove stems from mushrooms. Chop stems and the medium to large whole mushroom finely. I use the food processor. Brown the sausage in a skillet and simmer, covered, with about ¾ cup water for 5 minutes. 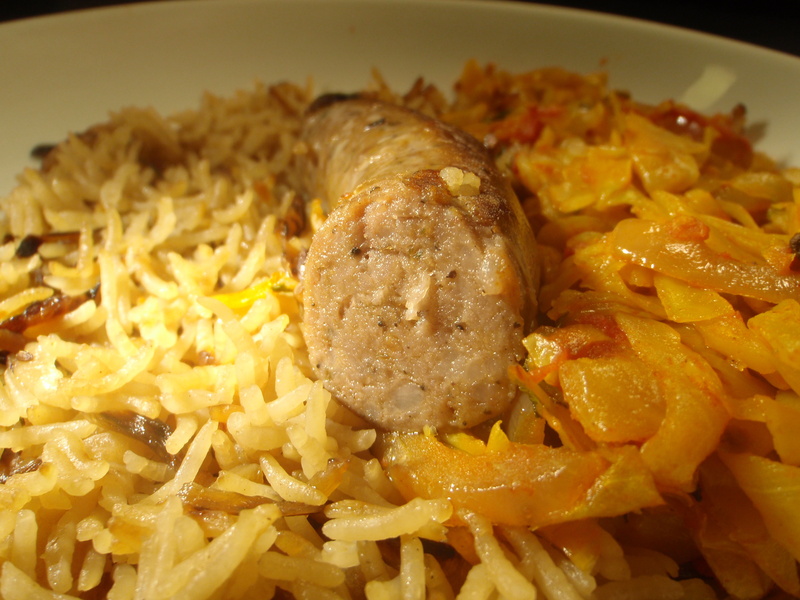 Remove the sausage and place on a plate to cool a bit while you continue with the recipe. Heat up ½ Tablespoon olive in a large saute pan with the red pepper flakes and ground coriander. Add the spinach and wilt, turning frequently. Stir in lemon zest and place spinach on a plate. Return pan to heat and add another ½ Tablespoon olive oil. Stir in the chopped mushrooms and cook, stirring occasionally. Stir in the garlic and heat through until fragrant. Remove from heat. 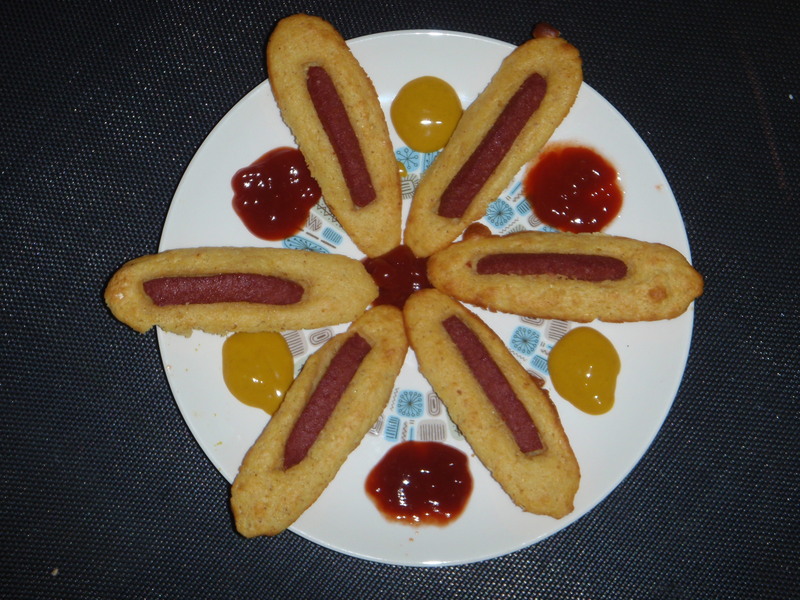 Halve each sausage lengthwise and then slice each half into ¼” pieces. Add sausage to the pan and return the pan to the stovetop on low heat. Chop the spinach and stir it into the skillet along with the garam masala, paprika, and 1 teaspoon salt. Heat through to finish cooking the sausage. Stir in quinoa, heavy cream, yogurt, mustard and Worcestershire sauce. Taste for salt and adjust as necessary. Prepare the mushrooms. Place a rimmed baking sheet, large enough to hold the eight portobellos, into the oven and preheat the oven to 400º. Using a sharp paring knife, slice ¼” deep cuts, spaced ½” apart into the mushroom caps. Slash again at right angles to the first cuts to create a crosshatched pattern. Brush the mushrooms on both sides with a total of 3 Tablespoons olive oil and sprinkle with a generous teaspoon kosher salt. 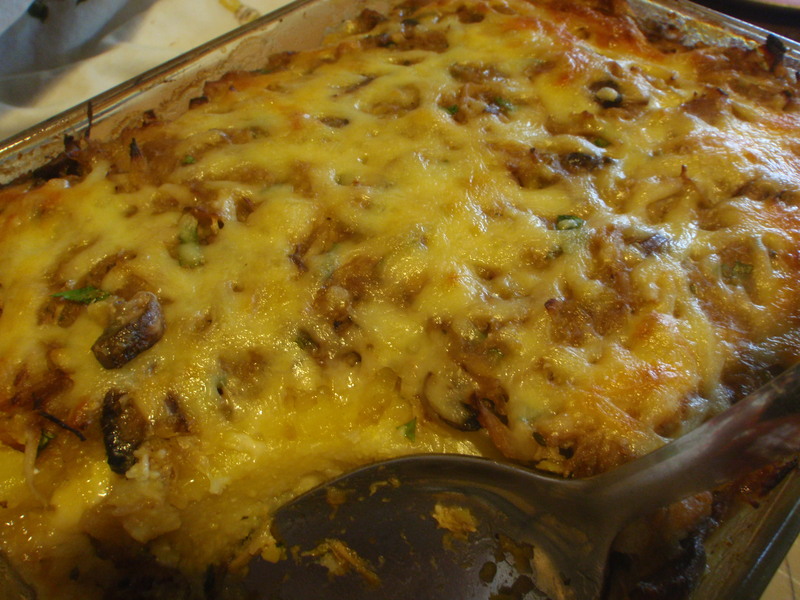 Place the mushrooms gill side up on the hot baking sheet, and return the sheet to the oven. 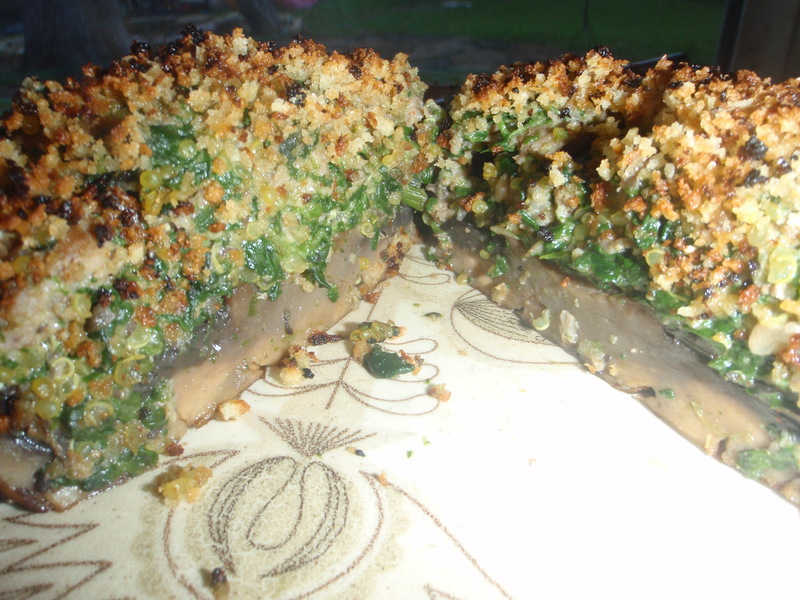 Bake for about 8 minutes, until the portobellos are browning around the edges and have released some of their juices. Carefully flip the mushrooms over and place back in the oven for another 8 minutes, until the juices have evaporated and the portobellos have browned. They should smell great! Mound about a ½ cup of filling onto the gill side of the mushrooms. Mix the bread crumbs and melted butter together. 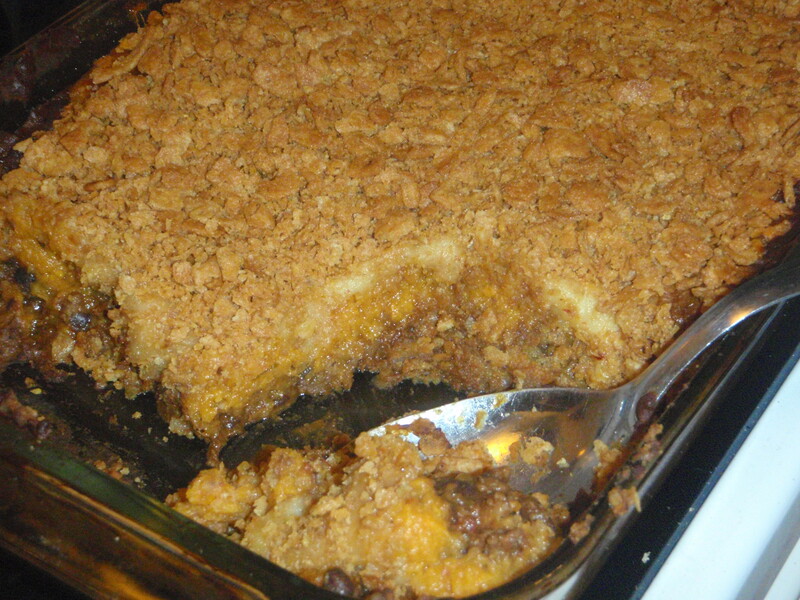 Top each mound with about 2 Tablespoons of the bread crumbs. Place the portobellos back on the baking sheet and return them to the oven under the broiler for a couple minutes to brown the tops. Serve hot.